1Department of Biotechnology, Defence Institute of High Altitude Research, Defence Research and Development Organization, Leh-194101, INDIA. 2Department of Biotechnology, Guru Nank Dev University, Amritsar-143040, Punjab, INDIA. 3Department of Biotechnology, Institute of Himalayan Bioresource Technology, Council of Scientific and Industrial Research, Palampur-176061, Himachal Pradesh, INDIA. Aim: Rhodiola imbricata is an endangered medicinal plant of the trans-Himalayan Leh-Ladakh region belonging to the family Crassulaceae. An efficient propagation and regeneration system via direct shoot organogenesis from leaf explant and evaluation of cinnamyl alcohol (Secondary metabolite) was established in this study. Material and Methods: In vitro grown leaves were inoculated using Murashige and Skoog (MS) medium supplemented with (alpha)- naphtalene acetic acid (NAA) in combination with 6- benzyladenine (BAP) for callus proliferation and regeneration. Results: The highest percentage of rhizogenous callus was induced in medium containing NAA (10.0-15.0 μM). The highest percentage of shoot formation from leaf derived callus was obtained in the medium containing of NAA (5.0 μM) and BAP (2.5 μM) as well as in NAA (1.0 μM), BAP (5.0 μM) (38.88% and 37.49%) respectively. Rooting of regenerated shoots were effective when a lower concentration of NAA (0.5 μM) was used alone. A maximum number of roots (22.0) and higher length (0.6 cm) was observed. 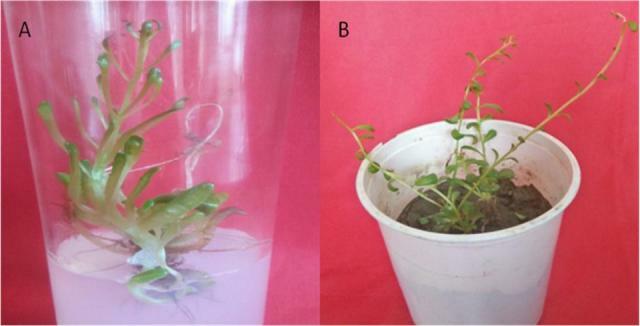 The in-vitro plantlets with well-developed shoots and roots were acclimatized successfully to natural field conditions with a survival rate of over 80%. Cinnamyl alcohol (Secondary metabolite) evaluation was also done for the very first time and an upregulation of 49.6% and 30.6% were observed in in-vitro roots and shoots when compared with mother root and shoot respectively. Hence, it was proved that the content of secondary metabolites obtained from in-vitro raised plants is higher than mother plant. Conclusion: These results may lay a foundation for genetic improvement and can be used to determine sequential level of targeted secondary metabolites through cell culture in Rhodiola imbricata. Schematic representation of in vitro root induction in Rhodiola imbricata (A) In vitro rooted shoots in agar gelled medium supplemented with auxin, (B) Hardening of in vitro rooted plants. Bhardwaj AK, Naryal A, Bhardwaj P, Warghat AR, Arora B, Dhiman S, et al. High Efficiency in vitro Plant Regeneration and Secondary Metabolite Quantification from Leaf Explants of Rhodiola imbricata. Pharmacognosy Journal. 2018;10(3):470-475.